When you look at a roof, it’s easy to concentrate on the shingles, but there’s a lot more to a roof than just the outer covering. A complete roof is made up of several different parts. Like a chain, the integrity of your roof is dependent on having all of these in good shape. Any structure is only as good as its foundation, and your roof is no different. No matter what shape your roof is, it all starts with the support structure that holds it up. In the United States, this is usually beams that are made out of timber or metal. Different materials are more common in other parts of the world, such as bamboo in Eastern Asia. No matter what structural material is used, the requirement is the same: The support structure has to be strong enough to hold up the roof and withstand the forces that will hit the roof. Insulation wasn’t as common on older roofs, but has become a common feature with modern, energy-efficient roofs. The best place for insulation is on the underside of the roof between the support structure. Part of this is because modern spray insulation has made it a lot easier to apply to the underside of the roof surface. The roof deck is also known sheathing. It creates the core surface of the roof, and is installed onto the support structure. There are a number of different deck materials that can be used, including plywood, roof pavers, OSB sheets, reinforced concrete, or metal. The first row of shingles is often applied directly to the decking. It can either be hand-cut shingles, or pre-made adhesive starter shingles. 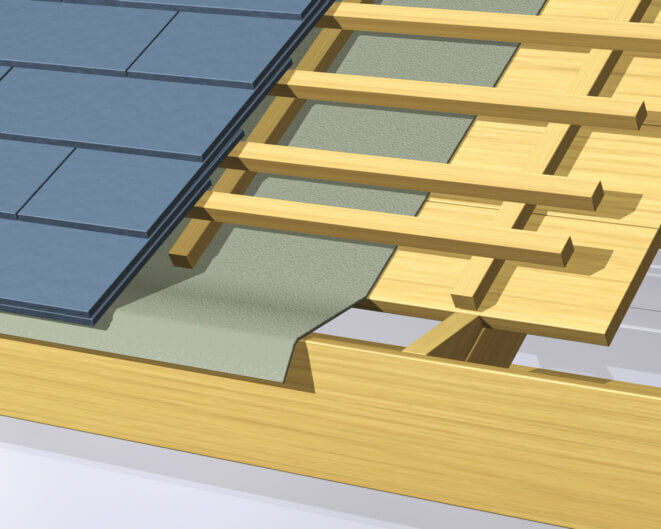 Either way, these are applied with a slight overlap on the roof, and are designed to keep your shingles from being blown off in severe weather. Underlayment is applied to the decking to provide extra sealing below the shingles, as well as give them a smooth, even surface for application. There are a variety of different underlayment materials that work better with different application. For example, a slate roof will use different underlayment than asphalt shingles. For most roofs, this will be shingles, though some flat roofs will use rubber roofing covered with gravel. You’ve got a lot of choice when it comes to shingles, everything from asphalt shingles (the most common option) to slate to wood to metal to tile. These are the key line of defense for your roof, and the visible layer, so make sure they match your style and your environment. In addition to shingles, this layer will also include any necessary flashing. Flashing is usually metal, and is integrated into the shingles where they hit other materials like chimneys, walls, vents, or skylights. Most of the shingles will be placed on the flat surface of the roofs, but the seams and edges of the roof will receive special attentions. The most common of these is ridge caps. These are specially made as a single bent piece designed to create a seal at any ridges of the roof. Many of these are installed on top of ventilation strips in the same ridge shape to provide additional attic ventilation.